Why Is Socialism Appealing To Young Americans? Americans between the ages of 18 and 29, according to a 2018 Gallup poll, have a more positive view of socialism than they do of capitalism. That also is true of Democrats of all ages. In no previous poll did socialism come off better than capitalism. How do we explain this shift in the country that has championed capitalism around the world? There are four reasons for the rising popularity of socialism. First, the 2008 financial crisis exposed the ways in which the unchecked greed of very rich financiers disrupted the entire economy and bankrupted millions of ordinary Americans while causing millions of others to lose their jobs and suffer long-term if not permanent damage to their economic futures. The fact that none of the principal authors of the financial crisis were imprisoned, and that instead the government bailed them out, leaving financiers wealthier after the crisis than they had been before, created widespread and deep anger. For younger Americans the financial crisis and its aftermath are all they have ever experienced of capitalism. No wonder they see it as a dysfunctional if not evil system. Second, a majority of younger Americans face grim economic futures. University education in the U.S.is expensive. Young people who are not from wealthy families can afford to pay for college only by taking out loans. As a result, when they graduate they are in debt for tens of thousands of dollars. That means they spend the first decade or more of their adultlivespaying off those loans, and so can not accumulate savings toward a down payment for a home and are unable to afford to have children themselves. College graduates more often than not end up with jobs that do not require advanced training and are not whatthey imagined or hoped they would land when they were students. Those jobs are precarious, and Americans of all ages are laid off or dismissed repeatedly and need to move from job to job. Most jobsinthe U.S. no longer offer retirement benefits, and so young people accurately believe that they will not have the resources to retire. Older American nearing retirement know they cannot afford to retire, or if they areforced out of work will live a meager existence relying on Social Security and limited savings. Third, the gap in income and wealth between a tiny elite and the rest of Americans is growing and also becoming ever more visible. The top 1% holds a majority of financial assets. Only the top 10% of Americans have seen their realincomes increase over the past forty years. The rich are increasingly willing to flaunt their wealth. During the Great Depressionof the 1930s, the rich were afraid of attacks by the immiserated and desperate majority of Americans and so live modestly or kept their wealth out of sight in remote suburbs, rural retreats, or in apartments not visible from the street. Today, the American rich, like those in much of the world, are confident that they deserve their wealth and that those beneath them will not try to take it away from them. They proudly display the fruits of what they view as their intelligence and daring. Amazingly, today’s rich invite journalists into their homes and offices to document their life styles and show off their property. Donald Trump is emblematic of such vulgar displays. Everyone else thus is aware of what the huge gap in income and wealth means for their consumption and material well-being. Fourth, young Americans fear for the future of the planet as well as their own individual futures. Global warming is obvious to almost all of them, and they expect they will livelong enough to experience its severe effects personally. They understand that CO2 emissions are caused by the unregulated exploitationof fossil fuels, which they see has been undertaken by private firms in search of profit. Mainstream pro-capitalistpoliticians in the U.S. are not offering convincing solutions to the problems of declining incomes, lack of good jobs, insecure retirements, financial instability, and global warming. All their proposals are complex and incremental and designed mainly to protect capitalists’opportunitiesto make money. 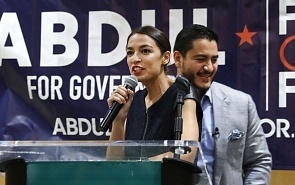 Instead, solutions that are ambitious enough to address the problems America, and its young people especially, face come from self-styled democraticsocialists like Senator Bernie Sanders and newly elected Representative Alexandria Ocasio-Cortez. Criticisms of democratic socialist policies, from mainstreampoliticians and media, are for the most part couchedin political terms. Rather, than saying the plans wouldn’t work, opponents say they are politically impractical, that rich campaign contributors and mainstream politicians will oppose them. This, in turn, leads young people to believe (accurately) that they only way to achieve their goals is to support what Sanders calls a revolution, to vote out both conservatives and liberals in favor of actual socialists. After years of having any reform that benefits the majority of Americans (Social Security, Obamacare, public education) labeled socialist, more and more Americans now equate socialism with any and all efforts to reduce inequality and alleviate the harshness of American society and to prevent global warming. There is no history of actual socialism in the U.S., and Americans see their society as distinct from all others, so saying socialism in America would create a society like Venezuela or the Soviet Union (which ended before a majority of Americans were born) is not a compelling argument against supporting candidates who call themselves democratic socialists. It certainly is too early to predict whether Bernie Sanders will get the Democratic presidential nomination, let alone if he then could defeat Donald Trump. More likely, a more moderate Democrat will be nominated and then if elected president will, like Obama, enact weak reforms that do not solve the problems that animate the growing appeal of socialism. That Democrat’s inadequacies will, in America’s two party system, lead to a futureRepublican president and another wave of reaction that further enriches the wealthiest and leads to deeper misery for the majority of Americans. When that happens, the number of Americans who see socialism as the only viable path to a decent future will continue to grow. 2020 may not herald the arrival of socialists to power in America, but their appeal is sure to grow over time.